During the days of Advent, join us as we focus on the quiet voice, that urges us to “be still and know”. True Anglican Tradition dictates that we focus on the season leading up to Christmas. During Advent our devotions, readings and liturgy have us looking forward, with anticipation, at the only gift Mankind has ever received that promises, peace, justice, forgiveness and eternal life. This tradition, focused on scripture and liturgy from the 1928 Book of Common Prayer, provides welcome respite from the chaos of the commercialism that began at pagen Halloween. As we focus on traditional worship, we are drawn into the poetic literary style of worship with the beautiful, cherished hymnody that remains timeless. You are invited to join us. Put aside the stress of modern day commercialism, the dread of overspending, worry of disappointing, or being disappointed, We are not a church that will be wrapped in tinsel, piping music from a rock band, with large overhead screens. 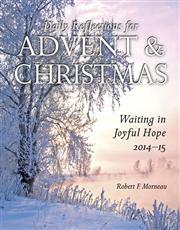 We are a community, where the quiet journey of Advent will be fulfilled in Christmas joy. Our destination is always the ancient liturgies of centuries old continuous worship, unbroken by trends and styles. Between the services, we have been discussing “Daily Reflections for Advent & Christmas”. This week at 9:15 on Sunday morning we will discuss the readings from December 14 to December 20.